The weather in Singapore has been warmer and more humid lately. To cool down, I chose any food that can cool myself such as local cold desserts, froyo (frozen yogurt) and soft serves. One of my favourites is frozen yogurt. 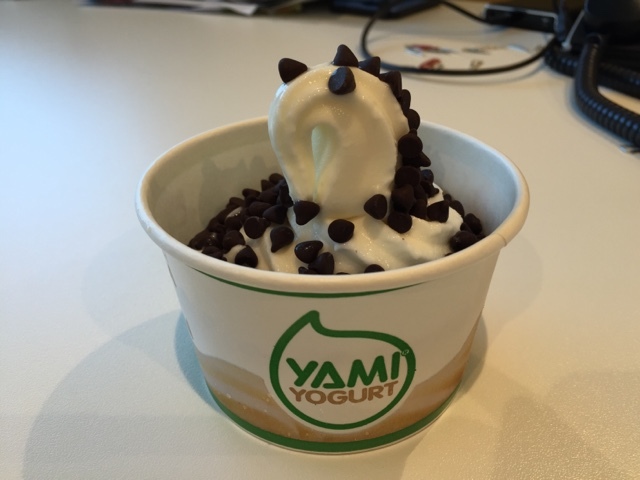 I have tried quite a number of frozen yogurt chains in Singapore such as red mango, llao llao, and now Yami Yogurt. Yami Yogurt is one of the first frozen yogurt outlets in Singapore as far as I could remember since I was little. It was only recently that frozen yogurt was popularised and mushroomed in different parts of the city. At Yami Yogurt, it have a wide variety of toppings which are categorised as regular and premium. The regular toppings priced at SGD0.95 offered only limited variety such as chocolate chips, colour rice, cereals, etc, whereas the premium toppings priced at SGD1.00 offered fruits, nuts and even dried foods. It was another hot day and I craved for something cold. Having tried the other frozen yogurt brands in the vicnity, I chose to buy frozen yogurt from Yami Yogurt. It has been a long time since I last bought a cup of yogurt from Yami Yogurt. I ordered myself a medium cup of original yogurt and added only one topping - chocolate chip. The medium or regular cup cost me SGD4.85. Amongst the frozen yogurt I have eaten, Yami Yogurt was more sour and less sweet in taste. I preferred Red Mango to Yami Yogurt and Llao Llao.